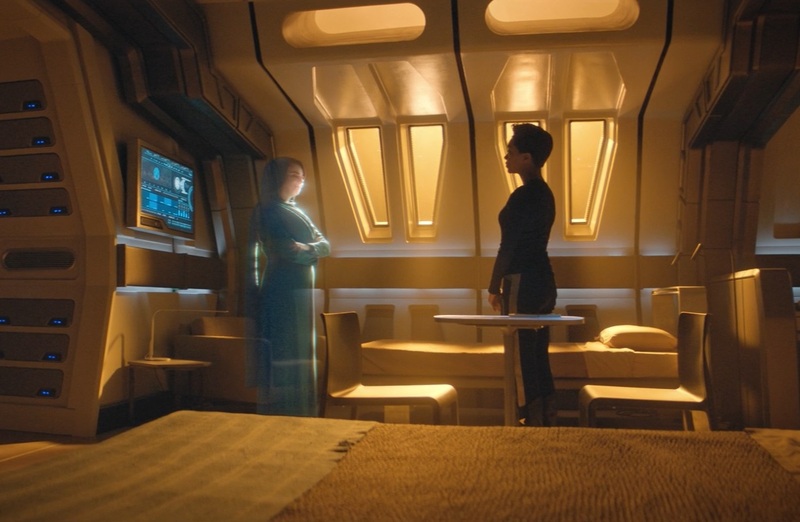 Previously on Star Trek Discovery: The Disco crew still can’t figure out where the seven signals came from and The Red Angel aka Burnham’s mom (Sonja Sohn) can’t offer any help. But she needs theme to delete the Sphere archive to prevent it from falling into the virtual hands of Control. But the archive wouldn’t let itself be destroyed, so instead, they decide to it into the Red Angel suit and let the micro-wormhole snap is back to the future. Meanwhile, Culber (Wilson Cruz) broke up with Stamets (Anthony Rapp) and Control infected Leland (Alan van Sprang) with nanoprobes, now controlling him. Control/Leland hijacks the data transfer and destroys the time crystal in the Red Angel suit. In order to keep the Sphere data from Control, the Disco crew brings down the containment field, sending Dr. Burnham and the suit into the future, with no clear way for her to return. Michael (Sonequa Martin-Green) is watching her mother’s logs again, when she gets a call from Amanda (Mia Kirshner), who knows all about what happened. Spock actually calls his mom, it seems. Michael is feeling a new guilt – while she no longer blames herself for her mother’s “death,” she’s now bearing the burden of the current situation, with her mother stuck in the future and unable to fight Control. But Amanda insists that she didn’t lose her mother, she found her. Spock (Ethan Peck) interrupts, as the two are needed on the bridge – because another signal has appeared. 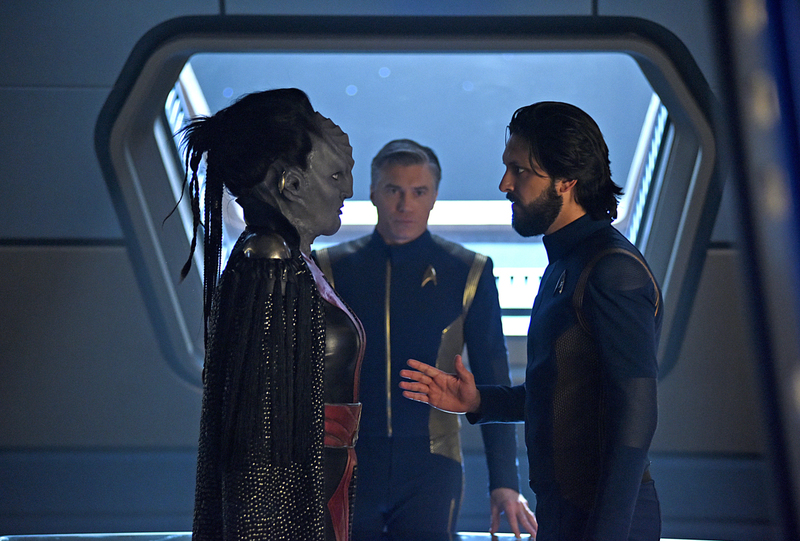 The signal is over the Klingon world of Boreth, information which visibly shakes Tyler (Shazad Latif). As a debate begins over who created the signals, their meaning, whether they’re a trap – all the stuff we’ve been through before – Burnham interrupts with frustration. Speculation is unproductive, waiting for answers isn’t fruitful. And Control/Leland is on the loose. She wants Discovery to join forces with Georgiou to hunt him down. Saru (Doug Jones) reminds her that they were unable to delete the Sphere data, and it’s most important that the archive be kept away from Control. 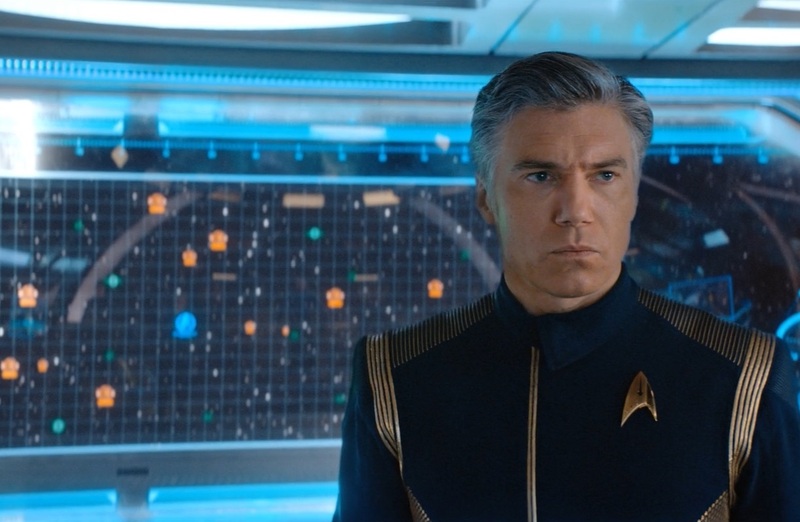 And Pike (Anson Mount) would prefer to focus on his mission – the signals. So why Boreth? All that’s there is a monastery. But Tyler will reach out to Chancellor L’Rell to secure safe passage. Disco jumps (?!) to Boreth, and Michael goes to see Tyler – she knows that he’s hiding something. 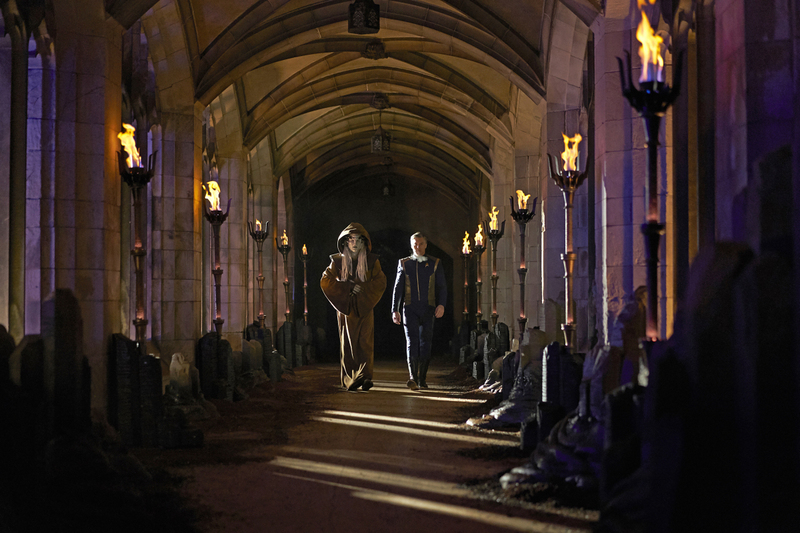 And he just comes right out and tells her all our his/Voq’s son with L’Rell, who is being raised by these monks. He apologizes for not telling her, but she only wishes she knew so she could support him. They’re tender moment is interrupted when Tyler received an alert that a Section 31 ship missed it’s checkin. But it’s probably nothing, right? Nope, Burnham wants to go check it out, and Tyler isn’t about to stop her. He just wants her to be careful. With Pike headed down to the surface, Burnham approaches Saru with her plan to go after the Section 31 ship (with a shuttle, keeping the Sphere data safe). Saru easily agrees, a bit to Burnham’s surprise; The crew is still adjusting to post-Vahar’ai Saru. And perhaps this new-Saru was the intent of whoever created the signal that appeared above Kaminar. He understands that Control is “an enemy we will only defeat by striking first” (anyone else flashback to “Battle at the Binary Stars”? ), but asks that she not allow her anger to affect her judgement. Pike arrives at the monastery, greeted by a Klingon (Ken Mitchell) who just happened to have the same distinct skin tone as Voq. The Klingon knows who he is and why he’s there, but believes that the effort is in vain. The Timekeepers are guardians of the crystals, not traders, and the crystals to not leave these walls. Even if a a crystal has Pike’s answers, this Klingon has seen too many people broken by the crystals to believe he’d strong enough to handle it. Pike insists on trying. Burnham is packing up her shuttle, when Spock comes to join her, supposedly as ordered by Saru. She’s a bit annoyed that she has a babysitter, but doesn’t fight, and off they go. 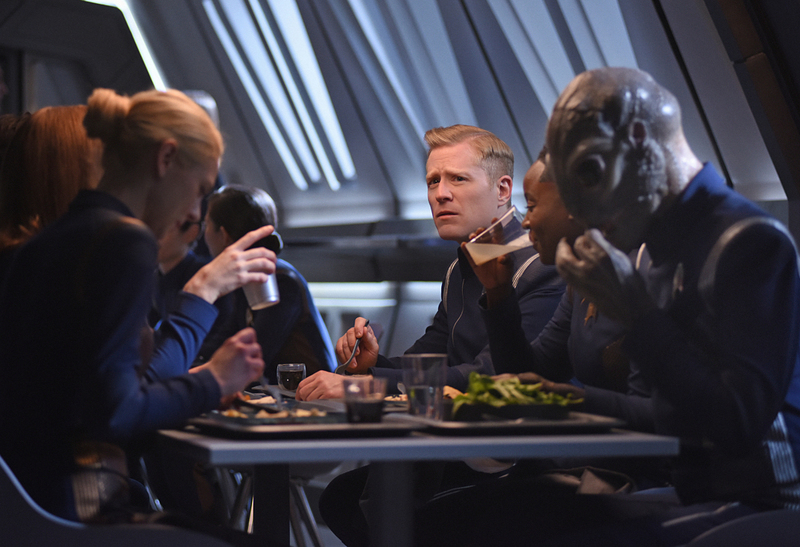 In the mess hall, jovial conversation all around him, Stamets is sulking. Jet Reno (Tig Notaro) approaches, congratulating him on another spore jump. But Stamets is focused on all the other problems on his task list, like an evil AI. No worries, Pike wants the two of them to work on powering a time crystal. But first, its time for some word games… until Hugh comes in. Reno acts surprised that Stamets hasn’t yet moved on, causing Stamets to leave in a bit of a huff, but not before a longing glance at his ex. The Klingon introduces himself to Pike as Tenavik, Son of None. That’s a title that Pike has heard before, and Tenavik nods, saying, “He was my father.” That means that Tenavik would have been an infant just a few months ago. You see, time works differently for those monks who work with time crystals. To prove his point, they watch a monk plant a vine-tree-thing that experiences years worth of growth in mere seconds. At this point, most Klingons thing the time crystals are a myth or a symbol, but their power is very real. Is Pike prepared for that? As the shuttle approaches the last known location of the Section 31 ship, Spock reminds Burnham that while he understands her desire to stop Leland, the signals seem to be leading them on the path to defeat Control. And the center of all this is her. Burnham refuses to accept that, or see meaning in the signals. But Spock insists on this connection, because it gives everything meaning. As the shuttle drops out of warp, they see the bodies of the entire crew floating in space and the ship apparently undamaged. They’re getting life signs from one of the bodies and beam it on board. It’s Kamran Gant (Ali Momen) former tactical officer on the Shenzhou. Gant had been trying to clear a suspicious subroutine when the ship suddenly opened all airlock are the crew blown out into space. He assumes it was the AI acting in self-defense. Luckily, Gant was able to get into an environmental suit before he passed out. 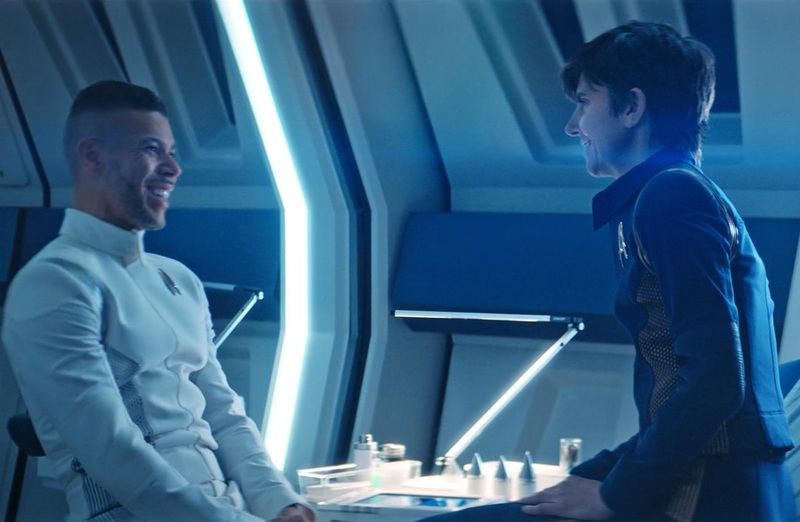 Burnham wants to beam over and figure out what’s happening on that ship, and with a little convincing, Gant agrees to go with them. L’Rell is monitoring Boreth while Pike’s on Boreth, and she will do whatever it takes to keep her son safe. She confesses to Tyler that she didn’t expect to see him ever again, but now they have the chance to talk. She has come to realize and accept that Tyler is in love with Michael. She was in love with Voq, and Voq sacrificed everything – including their relationship. And she fully understands now that the Voq she loved is not the Tyler standing in front of her. That being said, she knows that he will also do whatever it takes to protect their son. Pike and Tevanik approach one particular cluster, instructing him to “see for himself” by touching the crystal. But not before providing a warning that the crystal will life the veil of the present and reveal the potential horror of the future. Pike touches the crystal, and we suddenly see him on a starship at red alert with radiation reaching critical levels. He’s trying to get his people out of there, but gets hit with a plasma burst, throwing him across the room as the area goes into lockdown while he’s still inside. He then sees himself in after the accident, in the motorized wheelchair we’re all familiar with from “The Menagerie.” Both Pikes begin to scream, and the Pike on Boreth is startled from his vision. 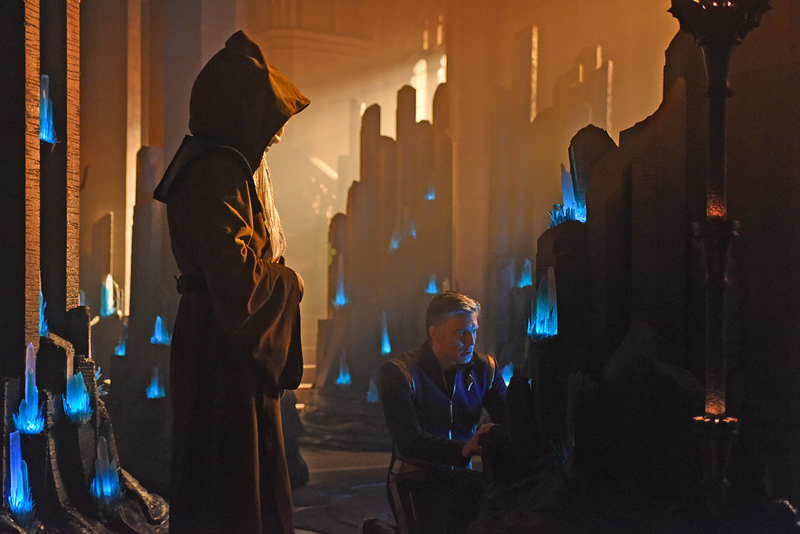 Tenavik tells Pike that he can change the future he was just shown, unless he takes the crystal. Pike knows that he chose a life of sacrifice as a Starfleet captain and refuses to abandon his principles because of an unforeseen ending. Tenavik breaks off the crystal and hands it to Pike, who again sees flashes of the future. There are a lot of ways they could have really effed this up – “The Cage” and “The Menagerie” are both pretty damn ableist – and IMO, I think they did a pretty good job with this. Burnham, Spock, and Gant beam from the shuttle to the Section 31 ship, but they don’t have limited access to the systems. As they try to gain more access, the ship powers up its engines and warps away. Jet Reno bursts into sickbay, requesting medical attention for a hangnail. Oh, but it’s all just an excuse to try to talk some sense into Culber. Stamets’s angst is affecting her work, so she needs them to figure this out. Culber notices Reno’s wedding ring, and she tells him about her wife, who died in the war, and was an awful lot like Stamets. “People like us always find people like them.” Culber has a second chance. Gant’s goal was to isolate Burnham from Spock. Not to kill her, but to recruit/assimilate/reconstruct her, as using her will be the most effective way to obtain the Sphere’s data. And that’s why Spock is finally able to reach her. Gant attacks, as Spock has to manually force open a door to get back on the Bridge. Gant is just about to inject Burnham with the nanobots when Spock pulls him off of her. 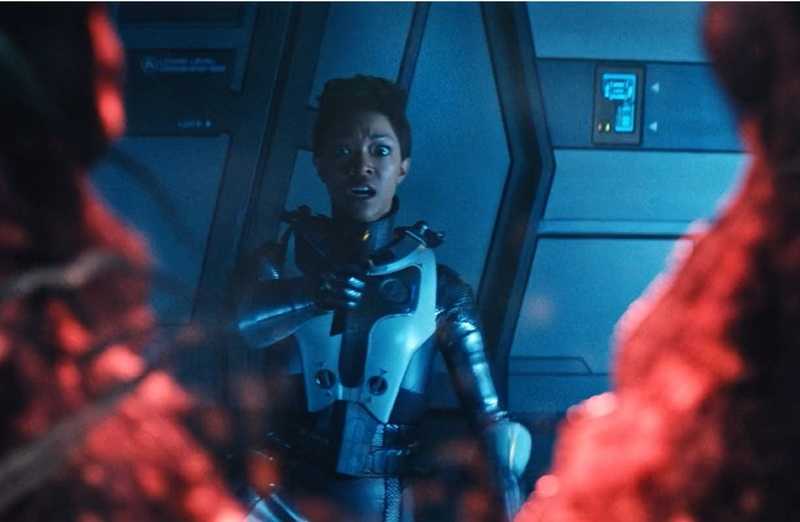 Burnham shoots at Gant, multiple times, and the nanobots come spilling out of him as he collapses, forming a wave or a swarm or a swarmwave that’s after her. Just in time, Spock is able to magnetize the floor plating, immobilizing the bots. Spock is then able to regain control of the ship, and learns that Control was blocking his tricorder from taking correct readings. Burnham drops them out of warp, to Spock’s surprised. But she doesn’t want to see where they were heading, it doesn’t matter. Spock believes that Control’s attempt to turn Burnham is proof that she’s the one variable its programming cannot account for. They’re going to head back to Discovery and trust the guidance of the signals. Which is exactly what Pike tells L’Rell. There are still three signals to come, and he trusts that they will help Disco fight Control. Before she leaves, L’Rell asks what the monks wanted in return for the time crystal, but Pike’s keeping that to himself. However, he does give L’Rell and Tyler an update on their son, who they had no idea would be affected temporally by living on Boreth. Tenavik sent back the symbol of the Torchbearer, which Pike returns to Tyler, and Mom and Dad share a moment. Burnham reports the lastest on Control to the rest of the bridge crew. It can co-opt ships and even people without being detected. The ship was headed to a region just outside of Federation space, but they don’t know why. And then, Section 31 ships start dropping out of warp all around them – practically their entire fleet. Pike wants to jump away, but Section 31 will just follow. And there’s not time to wait for another signal. They are outgunned, outmanned, outnumbered, outplanned. Burnham wants to self-destruct. So Pike calls in his right-hand woman. He sends a secure priority one message to Number One, asking her to prepare for emergency passage of Disco‘s full crew. They’re going to evacuate. Next week, the Enterprise comes to the aid of Discovery, and they find themselves starting a war with Section 31/Control (or maybe the Proto-Borg? ). Also, Number One (Rebecca Romijn) is back!